Thermocouple Calibrator designed to meet the requirements of AMS 2750E as a Secondary Standard for laboratory or field tests. 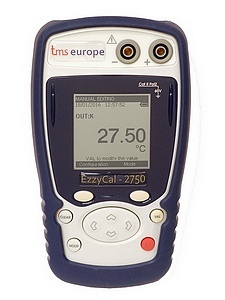 TMS Europe's EzzyCal - 2750 is a hand held thermocouple calibrator that is highly accurate, robust and user-friendly. It simplifies commissioning and calibrating thermocouple temperature sensors, transmitters and instrumentation. The EzzyCal - 2750 hand-held thermocouple calibrator will simulate and measure all common thermocouples (J, K, N, R, S, T, B, etc.). It meets and surpasses the requirements of AMS 2750E's 'Table 3' (Secondary Standard Instrument) specifications of ±0.3°F (±0.2°C) or ±0.05% of reading, making it suitable for laboratory or field tests. As well as a remarkable specification, it boasts a remarkable price, complete with UKAS calibration. It is, quite possibly, the most competitively priced instrument for specification on the market! The EzzyCal - 2750 is well suited to different process and calibration procedures thanks to its multiple ranges and advanced functions such as scaling, preset ramping and steps, all of which can be quickly and easily configured by the user as the job requires. Another of its advanced features is data logging, with the ability to look back at the recorded temperature data as a list of results or a trend graph. The optional EzzyCal - 2750 Charger and Batteries consists of a high quality 4x AA/AAA charger with a UK and Euro plug for 230V ac or 12V dc vehicle cigar plug. The four AA batteries are high quality NiMH rechargeable, pre-charged low drain over time 2100mAh batteries. The optional EzzyCal - 2750 Carry Case is a hard foam lined case with external dimensions of 260mm x 220mm x 80mm (WxDxH). Included as standard are the unit with boot fitted, batteries, soft carry case and English printed manual.